[by Kate F. Hays | New Harbinger Publications 2002] Research shows that exercise can be a powerful and creative tool for changing the way we feel, and that different kinds of exercise can be useful for easing anxiety, lifting depression, and managing stress. In fact, studies have shown that exercise can sometimes be just as effective for treating depression in the long term as cognitive-behavioural therapy. This text gives readers the tools they need to put together their own therapeutic exercise routine. 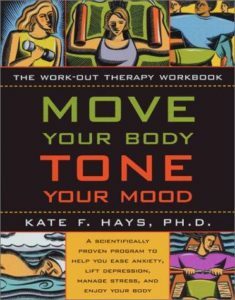 Author Kate Hays, president of the sports psychology division of the American Psychological Association, offers techniques for determining the best exercise schedule, provides tips for setting goals and establishing a routine, and shares strategies for using exercise as a form of emotional healing.